How can we help you and your employees succeed? Nuts and Bolts Contracting, LLC offers a variety of training programs to help you and your employees excel in every aspect of the construction or contracting business. All of our trainings are grounded in the principles and concepts found in our books. The goal of this foundation course is to help you gain full understanding of the principles and practices in the main Nuts and Bolts book so you can expertly implement them into your company using the exercises contained in the Companion Workbook and Owner’s Manual as a guide. Note that you will need to have a copy of the main book in your possession to take this training. This training is delivered online. You will have multiple learning opportunities to integrate the material being taught through written exercises, role-plays, videos, etc. An instructor is available as needed. I need more information before I enroll. Please have a representative contact me. The Nuts and Bolts Contracting certified consultant will work directly with your personnel, one on one, to train and guide them to implement the principles and practices into your company, section by section, through the exercises in the Nuts and Bolts Companion Workbook. This program is delivered live with a certified Nuts and Bolts Contracting consultant at your company location. Working directly with your selected section managers to assist them in implementing The Nuts and Bolts of Erecting a Contracting Empire Workbook and Owner’s Manual as they apply to each section of your company. Empowerment breeds great success in your contracting empire. This boot camp teaches your key people to continue to grow the company on a daily basis, as well as their own quality of life. The best way to utilize this service is to enroll and then send us the names of the attendees and their positions in your company. 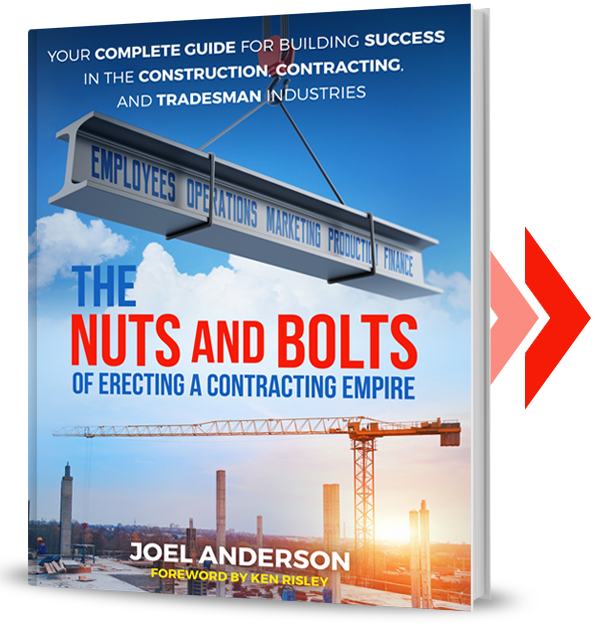 We will send the copies (up to 10 each) of The Nuts and Bolts of Erecting a Contracting Empire and the Companion Workbook and Owner’s Manual. Allow at least a week for your personnel to read through the material and understand what they will be doing. You can then schedule the boot camp for any week that is available. This process is done through e-mail and phone calls. If necessary, the consultant will call you to best tailor the boot camp to give you what you need and expect. Here is where it starts to get personal! When you register for the boot camp you will first receive a questionnaire which will help us tailor make the program for you and your company. Fill out the questionnaire right away and return it. We’ll take it from there. Plus applicable travel and lodging for the consultants. This is our most in-depth program and is delivered live with a certified Nuts and Bolts Contracting consultant at your company location. It is designed to dramatically improve the operational functioning of your company while putting you on track to significantly improve profits and your bottom line. Note: we only accept four applications per year for this service. A complete investigation, assessment, and evaluation of your company and its operational procedures, along with recommendations for making positive changes and resolving problems. Four one-week visits (one week per quarter) for one year. One-on-one consultations with you, the company owner, to solve any problems or make any corrections as mandated by the investigation. One-on-one coaching, up to five hours per week coaching/training with you in between quarterly visits. Private line directly to your consultant. A guaranteed increase in your company’s bottom line. "I have worked with Joel Anderson on several large projects in the past few years and have always been impressed with his ‘can do’ attitude. No problem is too big or too impossible to solve."